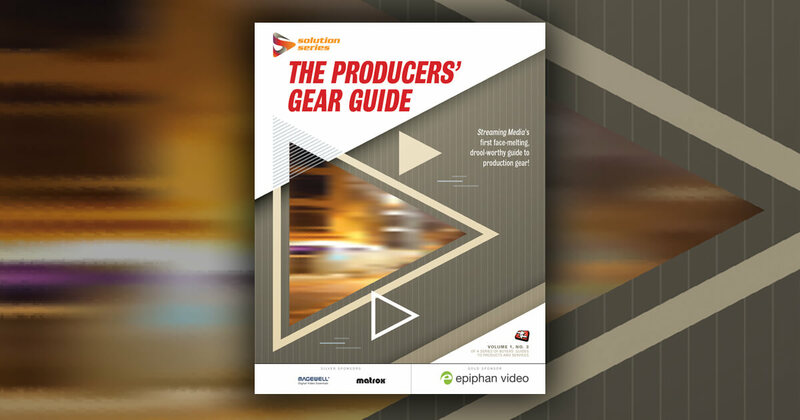 Choosing a video host for your productions means considering a balance of features, cost, and ease of/restrictions on distribution. In my business, I have several solutions ready to go, depending on the needs of the project and client. Some of my clients have their own accounts on YouTube or prefer to upload videos on Facebook when the videos are public-facing. I prefer uploading these videos directly to the clients’ accounts, rather than file-sharing with them and then having them upload the video files. Mostly, this is because I have a fiber internet connection with 175Mbps upload speed and unlimited data. For longer videos with larger file sizes, downloading them can be challenging for some users. This can require a bit of coordination with the client, thanks to two-factor authentication on user accounts. I like to get log-in credentials in advance and then log in for the first time with the client standing by to authenticate my session through email or text verification. I also have a few clients who have their own Vimeo accounts. I encourage them to subscribe to packages in the Pro or Business range if they have longer or multiple videos, so they can have less-restricted or unlimited weekly upload limits. 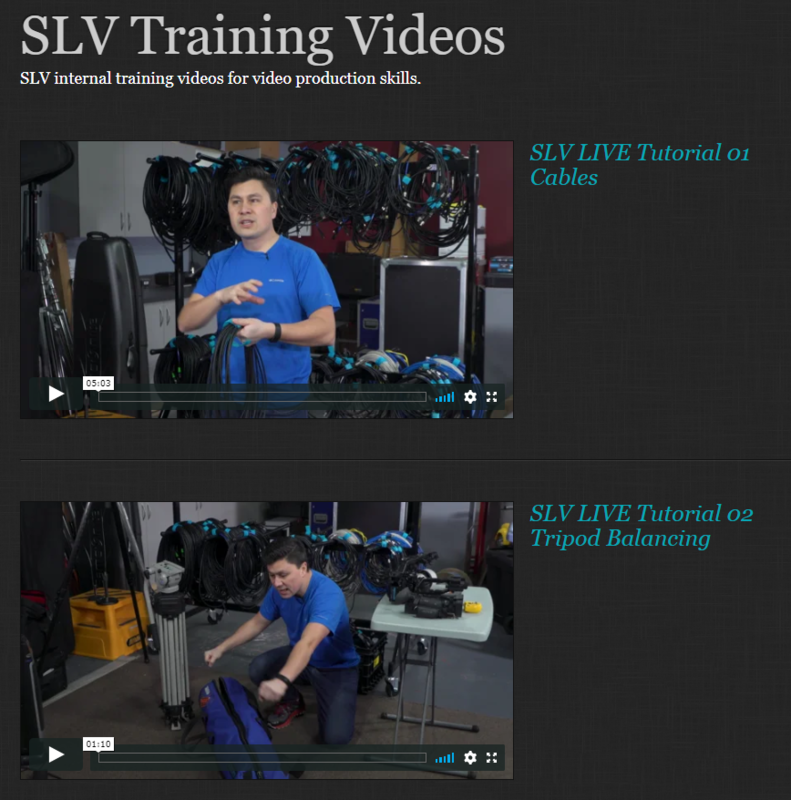 The 5GB weekly limit on the Plus plan might sound like a lot, but it is easily exceeded for my corporate clients with training session or conference videos. When upgrading the package isn’t possible or desirable, the workaround on my end is to encode the videos to H.265 rather than H.264. Encoding to H.265 takes significantly longer to encode, so I don’t like to offer this option too freely. That said, it reduces file sizes significantly, and saves me from having to encode beautiful 4K or HD footage to an SD resolution or bitrate that is too low. I also host much of the video I produce for my clients. My two go-to services are Vimeo and Wistia. In this article, I will discuss some of the advanced features I use. The choices depend on how much I need to secure access. 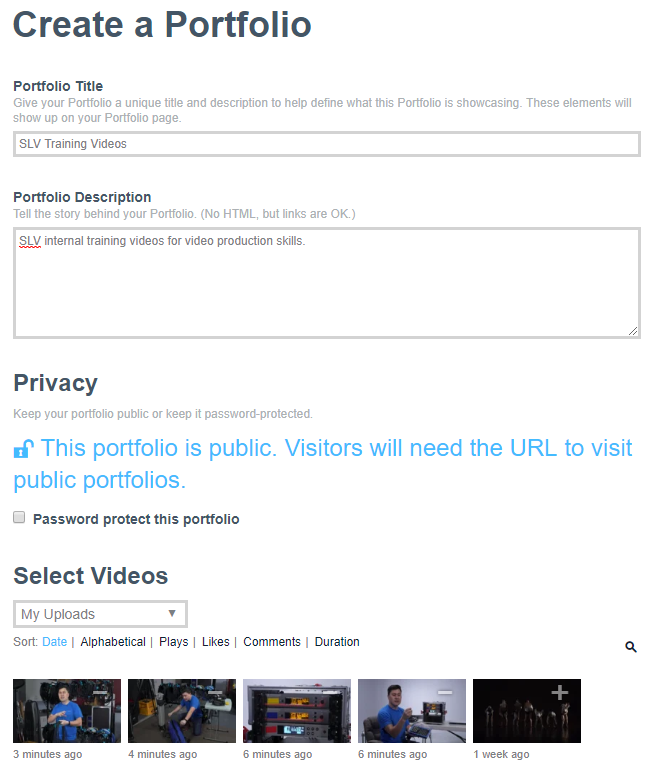 The advanced features on Vimeo that I like to offer to my clients include review pages and portfolios. Review pages are useful for sharing drafts with clients when you want their feedback. Unlike simply making a list of changes or having the client request changes using timecodes or visual cues, the client can link comments to specific times in the video. This is a big time-saver and avoids the challenge of interpreting where in the video the client is referring to. When new drafts are uploaded, the client has the option of playing the latest draft or reviewing previous drafts. I don’t use this option very often, and I prefer the old way of overwriting the previous version, mostly so the old drafts don’t count toward my total storage quota. What’s more, I don’t like that deleting old versions costs me time. videos from being found or viewed by anyone who doesn’t have the password. There are several template looks to choose from, but I prefer Linen (Figure 2, below). Overall, I find that Vimeo delivers excellent value and allows me to earn a margin on video hosting services as some of my clients pay me for hosting their videos on my Vimeo Pro account. Wistia is not as widely known or used by video producers as is Vimeo, but it offers features that some of my clients need that I can’t get through my Vimeo Pro account or other free video hosting solutions. The feature I use most is the ability to secure videos with individual user access. All Wistia packages, including the free one, allow the producer to register new users, and to control which videos they have access to view, share, and/or download (Figure 3, below). Individual user access is secured by individual passwords. When you add new users, Wistia sends them emails to let them pick their own passwords. Individual user activity can be tracked, including a heatmap report (Figure 4, below) that shows which parts of videos the viewer watched, rewatched, or skipped. 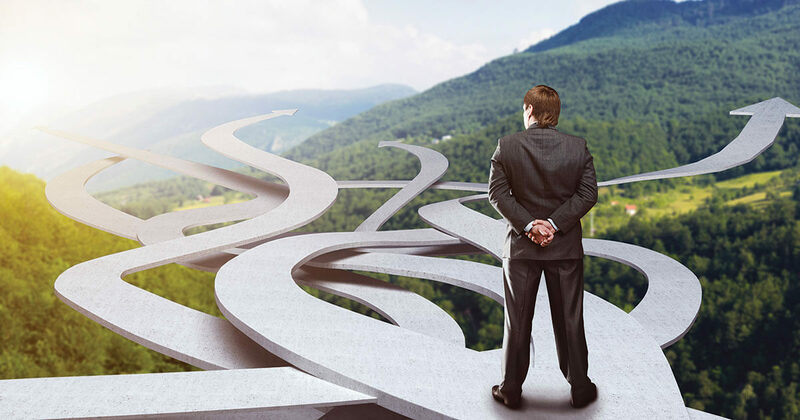 You can also choose whether to track IP addresses or not in case GDPR compliance is a requirement. I use Wistia when videos are sold to individuals or when the client wants a higher level of security and accountability. I find that because of this level of reporting and individual user accounts with passwords, individuals are less inclined to share access with others. I have a mix of clients whose videos are viewed directly on Wistia, while others embed the videos behind their paywalls or in member sites. From an embed code, it’s easy to figure out the direct URL of a video or to copy and paste the embed on another website. 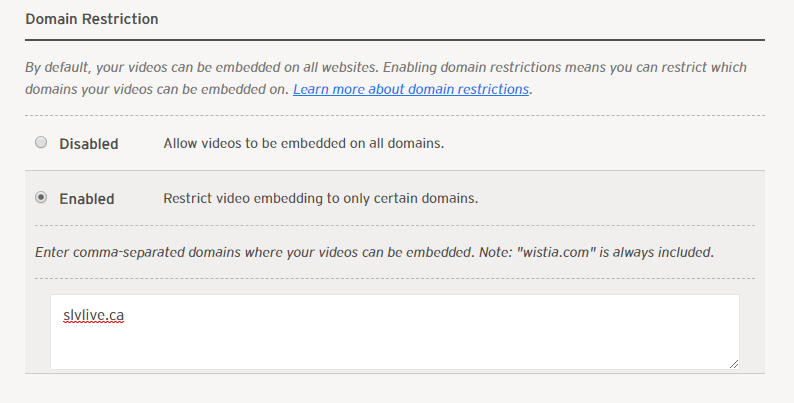 Both Vimeo and Wistia allow you to restrict embed codes to specific domains only (Figure 5, below). I have a client who enjoys this feature, and I know it works well, because every few years their website developers are tasked with moving the site to a new domain and to develop new website concepts on dev sites off-domain. Eventually, they contact me because they just can’t get my videos to work on their new sites, but realize they are still working on the current whitelisted site, and they just can’t figure out how this is possible and what they are doing wrong. Typically, they ask for a new embed code, but the issue is that their new sites haven’t been whitelisted. more for advanced security, review, and organization features, and in my business, video hosting is a profit center and not an expense.